When I visited my daughter last month, she brought in two of the puppies to amuse us. These little boogers moved fast! I finally got my better camera out and put it on continuous shoot. I clicked off several hundred shots in a short time and thankfully, there were some keepers of the whirling dervishes, such as this one of them scampering off with their toy. Any resemblance to a sandal is purely coincidental. Word for tomorrow – STONE. If you prefer to work ahead, see the list for the week under “A Word A Day”. They are soooo cute. But probably big trouble. . . This puppies were some of the brattier ones she’s had in a while. I think their owners are going to have their hands full trying to train these guys. I bet she did! I can’t post every day with something that has the movement that appeals to her, but I do try to keep that in mind since I know she looks forward to it so much. 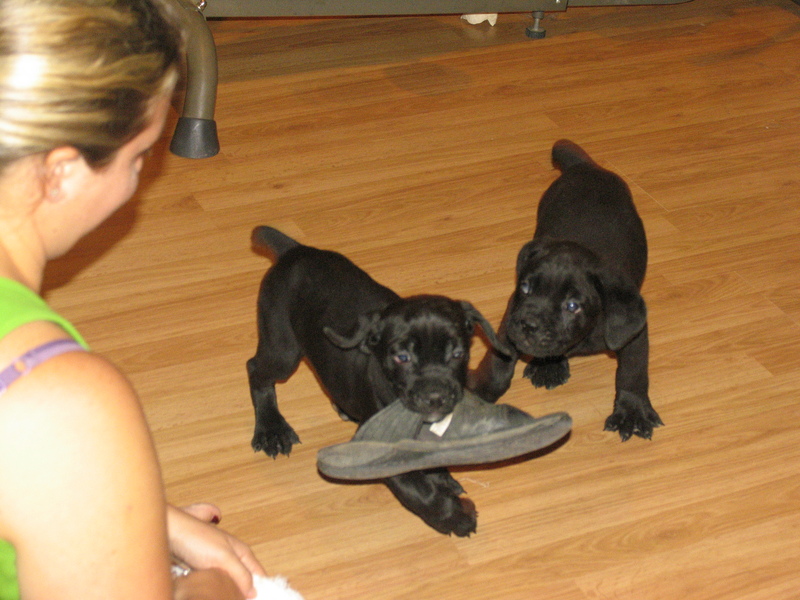 Pictures of puppies have a way of stealing my heart, but they obliviously enjoy stealing anyone’s shoes. They were into everything. They went after rags, socks, shoelaces, rugs, and nibbled toes. We finally had to put them back in their pen because they got so obnoxious.